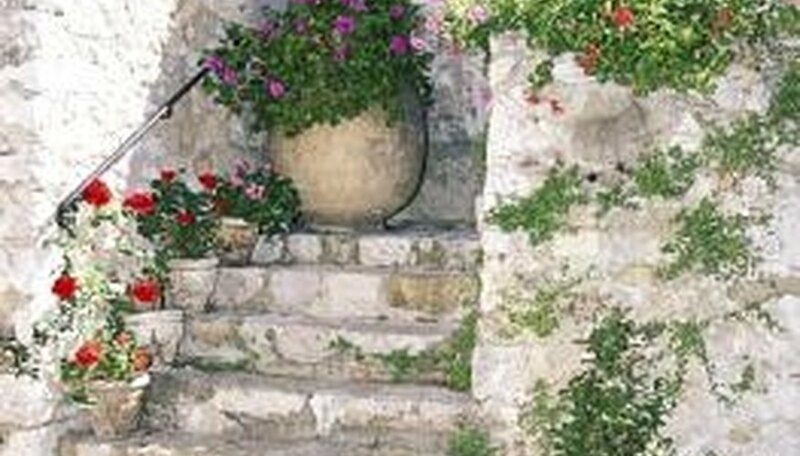 Stone steps are an attractive landscape feature that are actually relatively easy to install. Once you have the substrate laid and the stone in place, mortaring smaller stones so they stay where you put them isn't much different from decorating a Christmas cookie. The trick is that your primary stones for the steps need to be large and heavy so they are resistant to shifting and provide a strong central point for the smaller stones in the step to cling to. Additionally, it is helpful to have stones that are of equal height. This allows you to lay a substrate and only tap the stones in place. Set the first stone in place as a riser where you want the stairway to begin. For the strength of the entire stairway, this stone should be large and very heavy, though only approximately 10-inches high. If the stairs are free standing rather than excavated, use stones on the sides of the stairway as well. Fill the area behind the first stone with 8 inches of gravel, and then place the second 10-inch-high stone riser on this bed of stone. This stone can be smaller than the first riser stone, but must still be 10-inches high. Fill the area behind this stone with 8 inches of gravel. Continue doing this until you have built the steps up as far as they need to be built. Fill the remaining 2 inches of each step with coarse sand, then pack the sand into each step completely with the flat side of the shovel. Mix the mortar with water in a wheelbarrow according to manufacturer instructions until it is the consistency of peanut butter. Apply 1 inch of mortar on top of the sand as well as on the riser stones using the mason's trowel. Press the stones into the mortar bed until they are strongly embedded. Use a rubber mallet if necessary to position the stones. Make sure to overlap the stair riser stone on each level by at least 1 inch. Thin the mortar slightly by adding a small amount of water, and then load it into a mortar bag. Use this tool to squeeze mortar between the joints of the stone. Allow the mortar to cure for at least a week before attempting to walk on the stone steps. Misting the mortar lightly from time to time will result in a stronger mortar bond that is less prone to cracking.